Japanese relaxation with Italian accent. 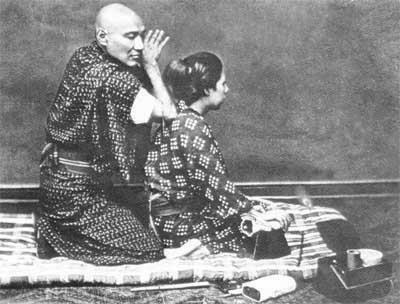 Shiatsu is a Japanese relaxation technique consisting to apply pressures with fingers, palms and elbows on acupressure points (tsubo), distributed the length of meridians. Shiatsu = "pressure with fingers"
Ki = energy who surrounds and vibrates inside every living being. Breath of life spreading and nourishing the body through meridians. Since VIth century some Buddhist monks start to settle in Japan, spreading the principles of traditional Chinese medicine, especially acupuncture ones, an ancestral ancient practice. At the end of XIXth century, after centuries of practice, several manual techniques coming from acupuncture are commonly used in Japan. Shiatsu is one of them and it will be codified in XXth century. Eastern medicines, especially traditional Chinese medicine, are based on the concept of vital energy Ki in Japanese). According to the Tao principles, two fundamentals entities exist, Yin (the Earth) and Yang (the Sky), complementaries and interrelated, present in every expression of life. Yin and Yang interaction gives the Ki, the force animating the whole universe and maintaining the life on earth. The Ki flows in the whole human body through meridians and feed organs. The length of meridians there are energetic intersections or vital points (tsubo in Japanese) used to stimulate Ki, as we do in Shiatsu. Internal fluctuations of Ki vary in function of our environment, our lifestyle, our diet and our emotional life. Shiatsu is a work on Ki allowing to get back the energetic balance. The physic wellness re-found will impacts on mental and spiritual levels. In Japan Shiatsu is an official medicine. In Japanese health system it is comparable to the role of physiotherapy in Europe. and in almost every European country where Shiatsu is a complement to the western medicine. It is one of the height alternative designed approaches in the A4-0075/97 resolution of Mr. Paul Lannoye, voted at the European Parliament 29th may 1997, approach recognised by the World Health Organisation as "non conventional medicine worthy of interest". Shiatsu is practised at floor level, the person receiving the session is dressed lying down comfortably. The Shiatsushi makes a specific sequence of pressures on different tsubos depending on the dysfunction detected. Pressures are directed to the deepest strata of the body to free energetic or muscular blockages. Every gesture is calibrated according to the body and adapted to the person's sensitivity. Some pressure points may be more sensitive than others, usually at first pressures. That' the manual and visible aspect. The efficacy of pressures is also based in some mental and more abstract factors such as the respiration, the the development of a positive state of mind and the focus of the practitioner who has to be completely in tune with Uké. Because of the deep action on the whole body, Shiatsu is able to relax muscles, to stimulate the endocrine and immune defence systems and induce a relaxation because of a positive effect on nervous system. The stress provokes mechanical reactions in the organism. For example, it may free hormones increasing breath and cardiac rhythm, then expand the muscular tone to prepare the body to escape or fight. At the opposite, when the body is relaxed, the cardiac rhythm slows down, the blood pressure decreases, the breathing is regular and muscles let go. Increasing the value of the person's resource, Shiatsu helps to quickly find again the natural reaction of relaxation and give up. It make better the blood circulation, make easier the respiration, ease tensions and rigidities. It give back tone and vigour stimulating the immune defence system. Shiatsu is a preventive aches efficient method and is not a substitute to official medicine. Nevertheless it is a perfect complement to treatments of a lot of pathologies. Indeed, it is based on the person's "self healing" process, made by a positive mobilisation of Ki. Very tight and stressed because of a period of exams at work, several times I called Stefano, who dispensed to me Shiatsu massages and used on me Ito-Thermie. Pour être toujours au courant des dernières actualités et bénéficier d'offres exclusives, abonnez-vous à notre newsletter !